Honda Motorcycle and Scooter India (HMSI) is organising an event named “Honda Revfest” nationwide across 8 different cities in India on August 4. In the Honda Revfest, essentially the company is planning to launch its new range of motorcycles including Honda CBR 650F and Honda Livo among others. The event will be hosted in eight Indian cities including Delhi, Mumbai, Kolkata, Hyderabad, Bangalore, Chennai, Indore and Ahmedabad. 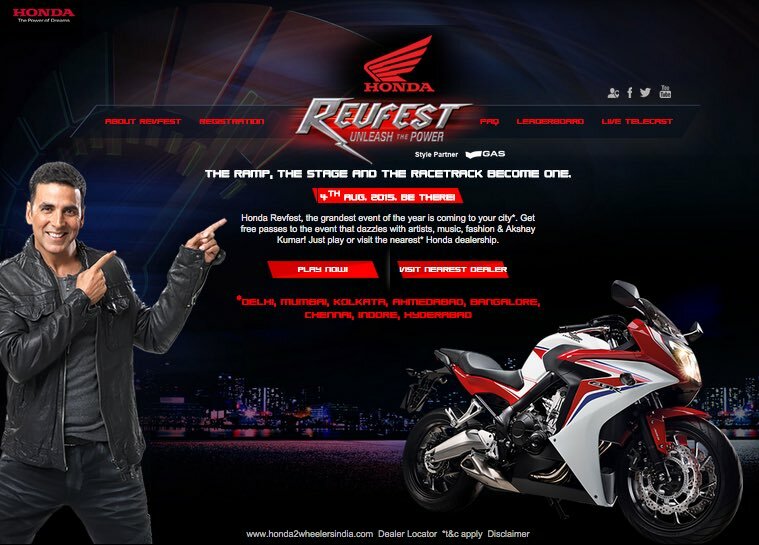 The full details regarding the Honda Revfest can be found on their exclusive event website: hondarevfest.com . During the event, Honda has planned to organise contests for those interested and there will be various artists performing at the individual venues to keep the crowds entertained. The hotly anticipated bike is Honda CBR 650F which was recently spied testing on Indian roads. This heavy weight bike is going to be powered by a 649cc, 4-stroke, 4-cylinder DOHC engine which produces a power of 87bhp at 11,000rpm and a maximum torque of 6.4kgm at 8,000rpm. The engine of Honda CBR 650F is coupled to a six-speed transmission, shifting gears in the 1-N-2-3-4-5 -6 pattern. Along with Honda CBR 650F, the company might also feature Honda Livo during the event.